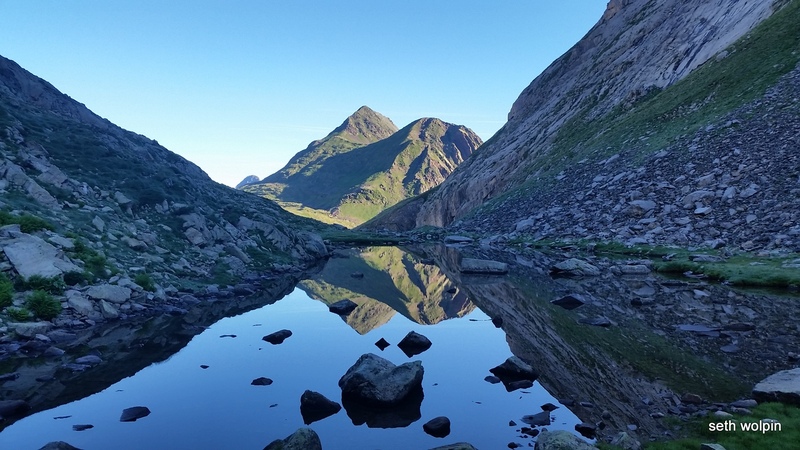 My last blog post was about spring in France, “European footsteps – Calais and the Pyrenees” and talked about experiences in the Calais refugee camp and rough plans for walking across the Pyrenees. The idea started almost a year ago October in Kathmandu. We were talking about adventures and Naomi mentioned that her family had a small house on the french side of the Pyrenees. It was very rustic and you had to hike up part of the ‘Le Chemin de la Liberté’ to get to the front door. 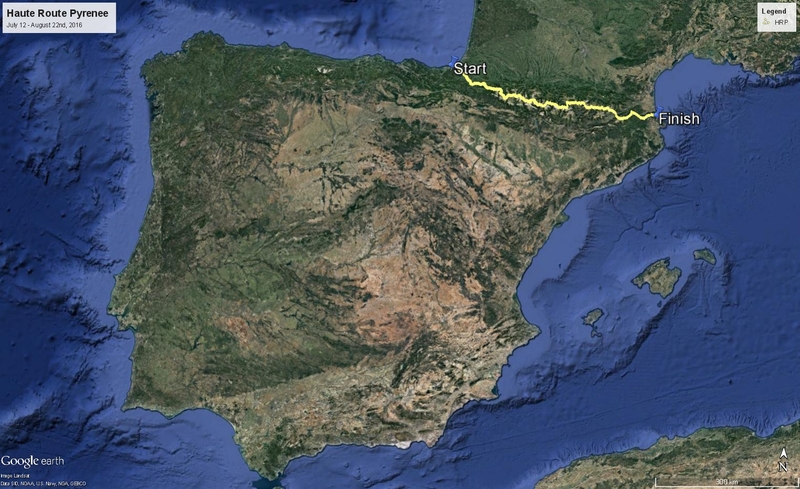 Now only occasionally walked, the ‘Trail of Freedom’ bisects the mountains connecting France and Spain and once served as a underground railroad, helping people fleeing from south from the Nazis and later north from Franco. Indeed the root cellar of the house had hidden many of these refugees. In the distance you could see a pass, on the other side was a different trail that stretched all of the way across the mountains from the Atlantic to the Mediterranean. 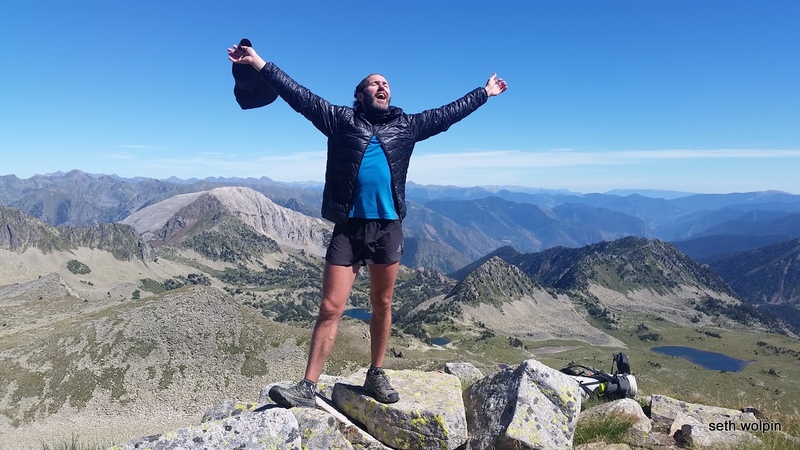 Called the ‘Haute Route Pyrenee’ (HRP) it does as the name implies, follows the high route – dancing along the border and periodically putting one foot foot in Spain while the other is in France. Some parts were hiking trail, some cattle trail, and some had no trail. 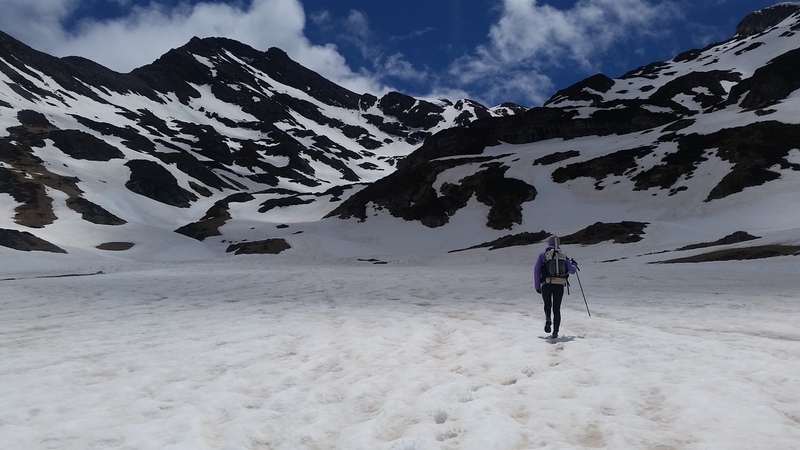 Most of the time the trail was far above treeline and there would be glacial lakes, alpine environments, and high passes where ice axes and careful footsteps a prerequisite. I loved the idea. Our recollection of the conversation differs at this point. I am pretty sure I heard Naomi say she wanted to thru-hike the entire trail, she insists she said she just wanted to do a part of it. Regardless, snow was just starting in the Pyrenees. July, 2016 was circled tentatively on our calendars and we turned to other topics.Of course April came fast. It found Naomi living in Paris and spending part of each week working in a refugee camp in Calais, France where thousands of people had reached a dead end in a makeshift camp outside of town, their dreams of reaching England stopped by electrified fences and militarized police. I was in Seattle working on some health research projects at at University of Washington. I flew to Paris and we rented a small apartment for two months. 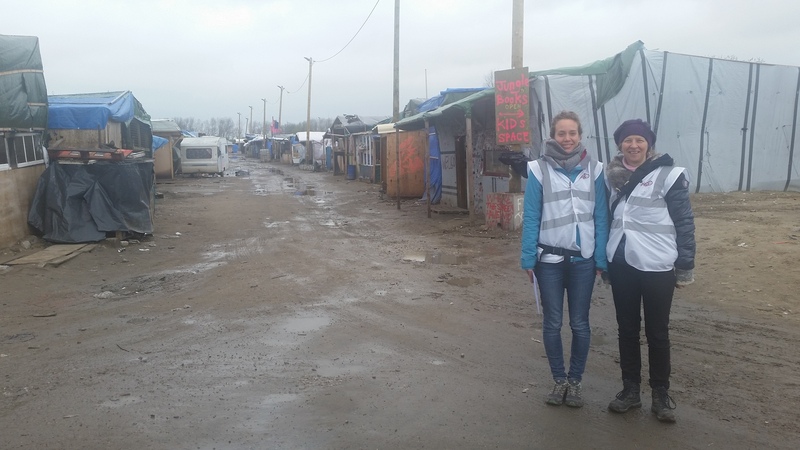 I started travelling to Calais each week with Naomi and in between we started to figure out the logistics of the HRP, calculating how long it would take, buying bulk food and new gear, studying trip reports and guidebooks. 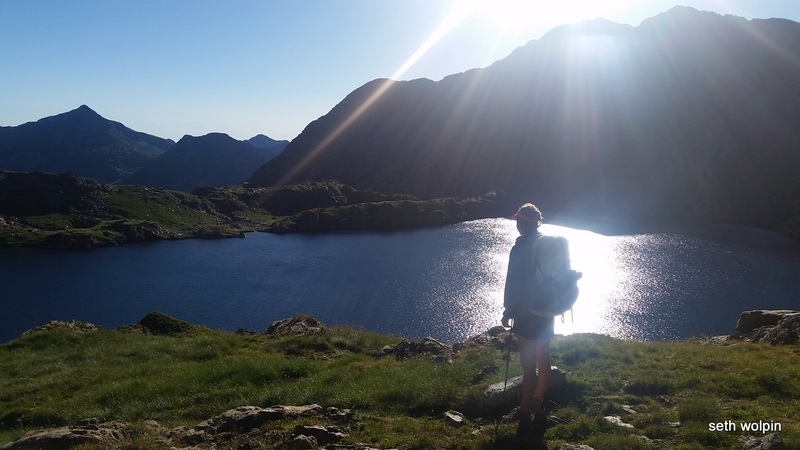 Her parents Julia and Nigel were going to be at the family house during the summer and wanted to meet us along the trail every week or so in their camper van, giving them a chance to explore other parts of the Pyrenees and us a chance to resupply. We organized six re-supply points along the rail and the better part of a weekend was spent making trail mix (a 27kg batch that was divided into innumerable zip locks) and packaging other food for the entire trail, all going into six large shopping bags to be stowed in the cargo box on top of the camper van. 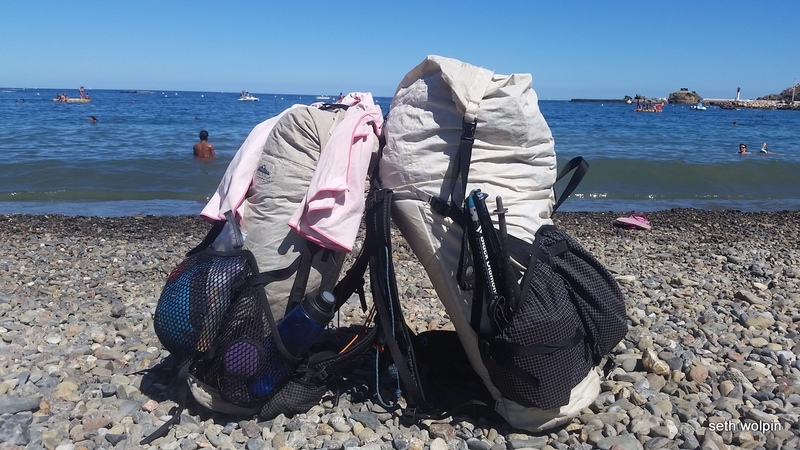 To make sure we had the right gear (and also just to have some fun) we went out on two ‘shakedown treks‘, one in the the Pyrenees and another along the coast in southern England. Long story short – We did it. A few simple words that sum up 800 kilometers of rugged trail, route finding challenges, steep climbs, and snowy passes. One of the high points was that my good friend Dan Price joined us for the first 2/3rds of the trail. We met 25 years ago on the Appalachian Trail when we were teenagers. It would be another nineteen years before we saw each other again in 2012 when I passed through Chicago on my transcon run. This time Dan was doing an art residency in Austria and had some time off before heading back to the States, he was able to join us for most of the first two-thirds. We also had the good fortune to walk literally past the front door of another old friend. When I was 12 years old we lived in Barcelona for a year and I became friends with Jordi Fabra Fulgado. We’ve kept in touch over the years – although the last time I saw him in person was 25 years ago. Our route passed by Jordi’s summer house near Salardu, Spain and he cooked a huge dinner for us, put us up in comfortable beds for the night, and saw us off in the morning. How else to characterize the trail? In numbers it was roughly 800 kilometers with over 50,000 meters of climbing. 42 days of hiking with only one full day off. Our goal was a good balance between smelling the roses and finishing with some time to spare at the end. It took us almost 7 days of walking through the foothills in Basque country before we started entering the high mountains. We bought cheese from shepherds who lived high in the mountains, walked through misty mountain tops, said hello to beautiful horses along the way, and slept in some of the most incredible wild campsites I have ever seen. I loved that we didn’t have to deal with any permits the entire time and could camp virtually anywhere. Sometimes our route dropped down and followed the GR10 in France or the GR11 in Spain, and once the Camino de Santiago. During these times we often saw many other hikers – but most of the time we were much higher and saw few people. That said, we met a few folks along the way who were also doing the HRP and frequently hiked and camped with them. We carried ice axes and small crampons (micro-spikes) for the first half and had some challenges on high points. Meeting up with Nigel and Julia was always a high point with cold beers from the camper van fridge, a home-cooked meal, and good company. I can’t thank them enough for their support and hospitality. Many of the days we had the trail to ourselves, but we also met some really great people taking on long sections or the entire trail. Our last few days on the trail were incredibly windy. As we saw the view in the distance shift from mountain peaks to the blue sea our spirits rose. It is the second time I have been able to connect to large bodies of water together with a journey on foot – there is no better way to mark the end of an adventure in my book than to jump in an ocean and call it ‘done’. Thanks so much to everyone who helped us with this trip, who became our friends along the way, and especially to Dan and Naomi for sharing so many footsteps with me. Below are some more pictures. At a later date I will add some notes about logistics and GPS tracks for others who have an interest. 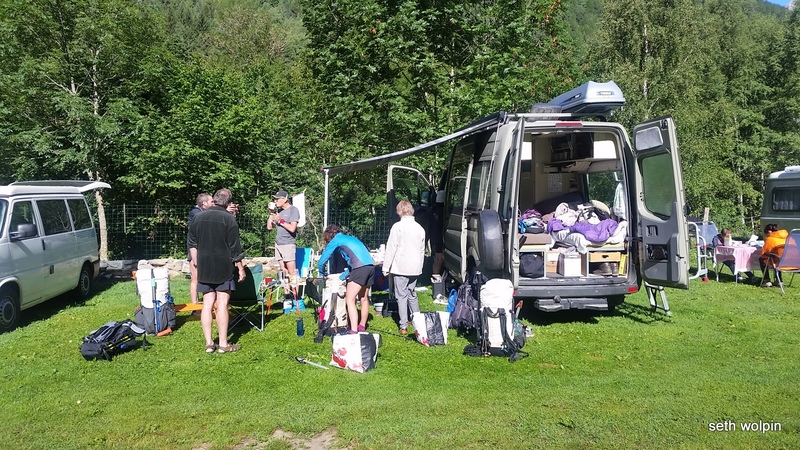 We bounced from the end of the trail back into the mountains for a few days of rest before driving to Italy to help out with Ultra Tour de Monte Rosa, a three day stage race in the alps (RD Lizzy Hawker). From there – finally back to Paris and then I flew to Kathmandu for some adventures and work on Sept 9th. And Naomi is back in Calais where the camp has swelled to 9,000. Tomorrow I will leave the city with a small group of trail runners and we will do the Annapurna Fast Pack around the circuit: quick, light, and self-supported. Back to Seattle on October 18th. So many adventures! Indeed, we were lucky to have this opportunity to explore the world on foot at our own leisure. This is not the case for so many refugees in Europe and around the world who flee traumatic events on foot and face long overland migrations. Our trip was not like theirs by any means, but we hope in some small way we can benefit others by our walk. If any of this inspires you to embark on your own adventure, or if you simply would like to help the refugees in Europe – I hope you will consider a donation to Art Refuge UK. Leaving the ocean and heading into the foothills of Basque country. Super fun to meet Matt Halfer and Laurel Ashley on the trail! I love your adventures! Thank you for sharing. 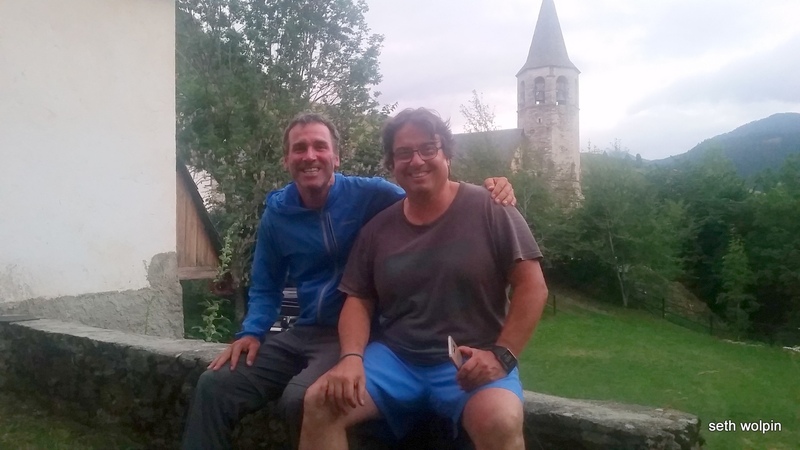 i also hiked the pyrenees this summer http://www.trekthepyrenees.com/gordon-s-blog/the-daily-joys-of-doing-and-completing-the-pyrenean-mountain-traverse, then ran the utmr stage race. thanks for helping there. i did half the gr11 in 25 days. congrats on the haute route which is difficult.